US-Import Poster. 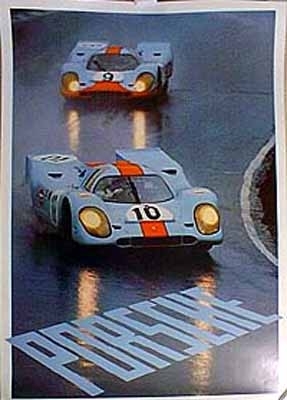 Gulf Porsche 917s at Brands Hatch 1970.No.10 Pedro Rodriguez, no.9 # 9 was Jo Siffert/Brian Redman.This poster is descended from a serial of 12 different 30 years old poster collection. Very exclusiv. Absolutely great! 80 x 53 cm , 32 x 21.2 in. Printed on a very expensive paper. Do you have a question concerning our product 'Us-import Gulf Porsche 917s At' ?